Sasakawa Peace Foundation and BlueOrchard Finance have partnered to contribute to empowering women across Asia. Sasakawa Peace Foundation invests the first JPY 1bn of its Asian Women Impact Fund into BlueOrchard Microfinance Fund. Women’s empowerment is a goal in its own right but also a key factor for sustainable economic, social and environmental growth. In the resolution on its 2030 Agenda, the United Nation’s General Assembly therefore strongly emphasized that realizing gender equality and the empowerment of women will make a crucial contribution to progress across all the 17 Sustainable Development Goals (SDGs). The SDGs recognize women’s equality and empowerment as both the objective and part of the solution towards sustainable development. Given that the vast majority of microfinance clients are women, microfinance has demonstrated an important role in achieving many SGDs and is being seen as a promising key for women’s empowerment. It is against this backdrop that Sasakawa Peace Foundation (SPF) and BlueOrchard Finance have partnered to contribute to empowering women across Asia. It is SPF’s mission to address the diverse and complicated issues that human society is encountering in the 21st century. As of 2017, SPF has made women's empowerment one of its five priority goals and has launched various programs aimed at solving problems in this area. Accordingly, SPF has established the Asian Women Impact Fund, which aims at promoting women's economic empowerment and gender equality in Southeast Asia. 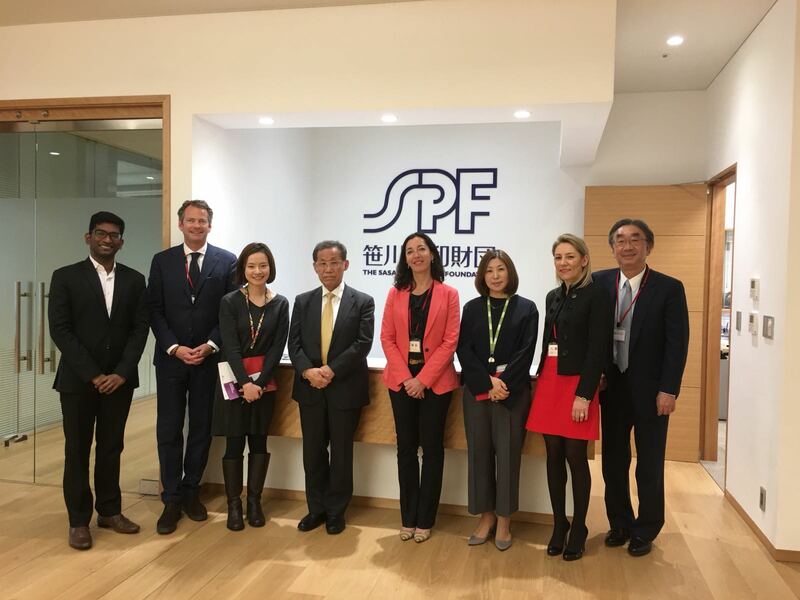 Building on common values and goals, SPF has decided to invest the first JPY 1bn of its Asian Women Impact Fund into BlueOrchard’s flagship Fund, the BlueOrchard Microfinance Fund. BlueOrchard has been promoting women’s empowerment through its various investments since 17 years. BlueOrchard was founded in 2001 by initiative of the UN as the world’s first commercial manager of microfinance debt investments. The firm has invested to date more than USD 4.7bn across 70 emerging and frontier markets, providing access to financial and related services to over 35 million low-income individuals. BlueOrchard’s funds proactively address 13 of the 17 SDGs. “Sustainable development cannot be achieved without women’s empowerment. BlueOrchard is fully dedicated to empowering women and ensuring women’s access to financial services. Building on our 20 years of experience, we look forward to supporting the Sasakawa Peace Foundation in reaching their goals,” said Peter A. Fanconi, Chairman of the Board of BlueOrchard. “This is the very first investment Asia Women Impact Fund made and we are confident about the impact that BOMF can create in providing access to capital to women in Asia. Grant-making needs not to be the only approach for foundations to make impact. Through this initiative, we hope to encourage like-minded foundation peers to consider implementing impact investing to their philanthropic and asset management activities.” said Mr. Shuichi Ohno, President of the Sasakawa Peace Foundation. The Sasakawa Peace Foundation (SPF) is a Japanese private foundation established in 1986 with an endowment from the Nippon Foundation to enhance international cooperation. After merging with the Ocean Policy Research Foundation in 2015, SPF has set its focus on five key areas: to address a variety of societal challenges that fast-emerging Asian countries currently face, to stimulate greater socioeconomic progress through women’s empowerment, to promote understanding and strengthen relationships with Muslim-majority countries, to further strengthen Japan–U.S. relations and, lastly, to develop programs to promote the long-term sustainability of the world’s oceans. In 2017, SPF carved out about 100 million USD from its endowment to establish Asia Women Impact Fund. The Asia Women Impact Fund envisions a future where all women in Asia are empowered to reach their full potential. The fund aims to realize this vision by making investments to achieve favorable outcomes for women across Asia and to support women entrepreneurs in Southeast Asia.